A number of conservation groups, including World Wildlife Fund, have in recent years adopted an approach to conservation that uses ecoregions to identify biological and conservation priority areas. Ecoregions define distinct ecosystems that share broadly similar environmental conditions and natural communities; as such, they make more sense for priority-setting efforts than do political units such as countries or provinces. 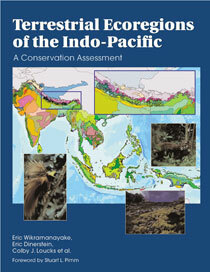 Terrestrial Ecoregions of the Indo-Pacific offers a comprehensive examination of the state of the Indo-Pacific's biodiversity and habitats, moving beyond endangered or charismatic species to quantify for the first time the number of mammal and bird species, including endemics, in each ecoregion. Short essays by regional experts -- including Derek Holmes, Tony Whitten, Indraneil Das, Walter Erdelen, John Seidensticker, Joyotee Smith, Kathy MacKinnon, and others -- address special topics relating to finer-scale conservation issues or ecological processes that are typically overlooked in a regional-scale analysis. Chapter 3. Representation or Triage? Chapter 4. Where Is Biodiversity Distributed? Chapter 5. Where Is Biodiversity Under Greatest Threat? Chapter 6. What to Save First?